Specialist Raku kilns can be quite expensive to buy, but with a few tools, it is possible to create your own Raku kiln at a much lower cost. It is also fun and a great sense of achievement! Here’s how I made my Raku kiln. I’m now on my 3rd one like this and it’s still my favourite way to Raku fire my ceramics! 1. 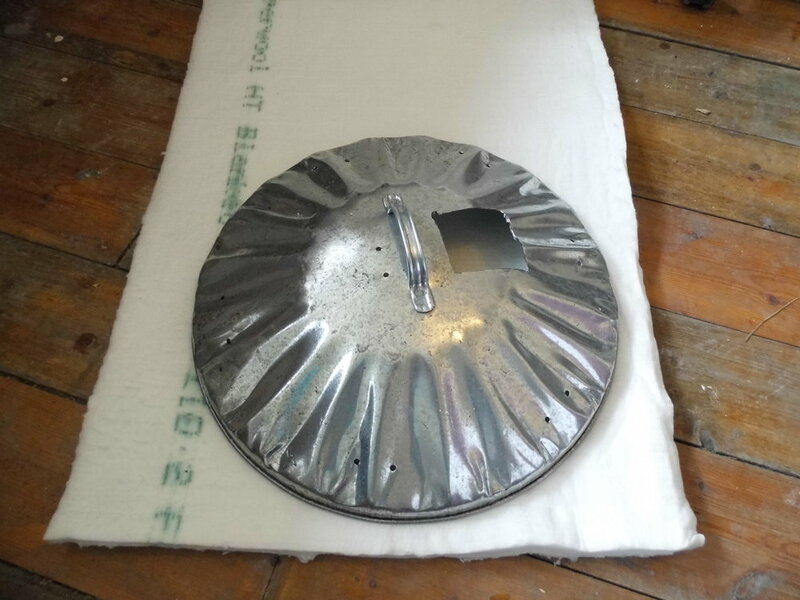 A hole is cut in the lid at least 10cm/4inches in diameter. Pairs of holes are drilled at intervals around the edge of the lid and also near the centre. 2. The lid is laid on the roll of body soluble ceramic fibre. Cut fibre out to fit inside the lid. 3. The ceramic fibre is pressed into the lid. 4. 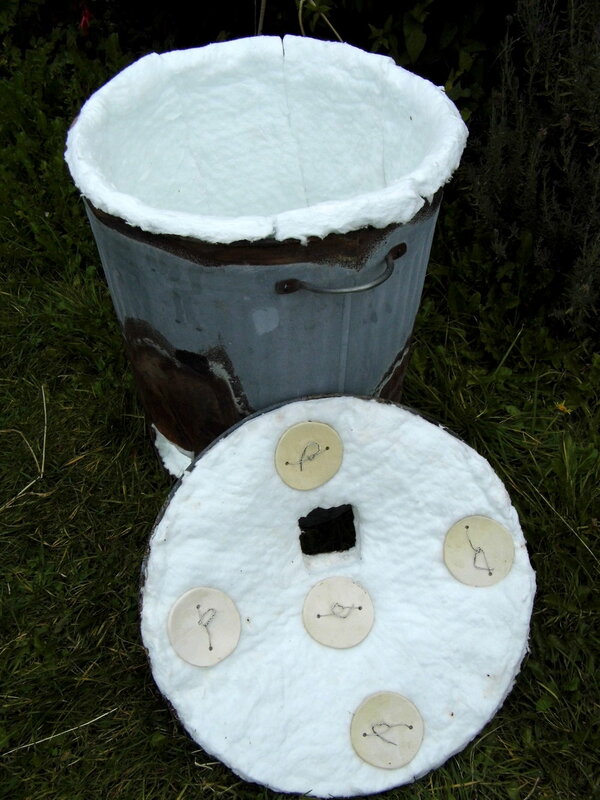 Pre-made and fired ceramic buttons are wired in place to hold the lining to the lid. Heatproof nichrome wire is used as it can withstand the heat whilst firing the kiln. 5. Strips of ceramic fibre are cut to line bin vertically, they will hold themselves in place without any fixings. Also cut a disc of fibre to line inside the base of the Raku kiln. 5. Another hole near the base of the kiln allows a Raku burner to heat the kiln. Once the Raku kiln is made you can use a solution of Rigidiser to spray on the side of the kiln to hep to harden and preserve the top layer of ceramic fibre. Please note: Always use a face mask/dust mask and gloves when handling the ceramic fibre and make sure it is body soluble. This means that if breathed in the fibres won’t remain in your body. Just add a Raku burner, some tongs, heatproof gloves, a metal dustbin for sawdust and a metal bucket for water and you have a simple set up to Raku fire your bisque fired ceramics.